VALLETTA, Malta (AP) — A Maltese investigative journalist who exposed the island nation’s links to offshore tax havens through the leaked Panama Papers was killed Monday when a bomb exploded in her car, the prime minister said. 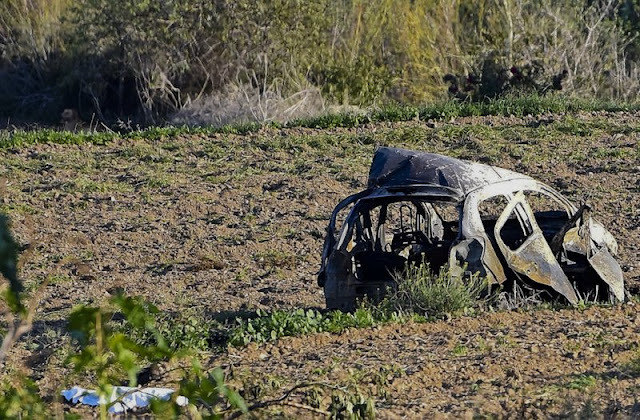 Daphne Caruana Galizia, 53, had just driven away from her home in Mosta, a large town on Malta’s main island, when the bomb went off, sending the vehicle’s wreckage spiraling over a wall and into a field, Prime Minister Joseph Muscat said. Caruana Galizia’s death resulted from a “barbaric attack” that also amounted to an assault on freedom of expression, Muscat said. He said the journalist “was one of my harshest critics, on a political and personal level” as he denounced her slaying. One of the topics she examined was the Maltese content in the Panama Papers leaked in 2016. She wrote that Muscat’s wife, the country’s energy minister and the government’s chief-of-staff had offshore holdings in Panama to receive money from Azerbaijan. Muscat and his wife, Michelle, denied they had companies in Panama. Caruana Galizia filed a police report two weeks ago saying she was receiving threats, law enforcement officials told Malta news outlets on Monday. A half hour before she was killed, she posted to her website an item about a libel claim the prime minister’s chief of staff had brought against a former opposition over comments the latter made about corruption. Caruana Galizia herself had been sued for libel over blog entries. Opposition leader Adrian Delia sued her over stories linking him to a prostitution racket in London. Economy Minister Chris Cardona claimed libel when she wrote that he visited a brothel while in Germany on government business. Muscat said he has asked the U.S. government and the FBI for help investigating the car bombing. Caruana Galizia is survived by her husband and three sons. One son, Matthew, was on the International Consortium of Investigative Journalists team that won the Pulitzer Prize for its work on the Panama Papers scandal. The leak exposed the identities of rich and powerful people around the world who allegedly had offshore holdings in Panama. Caruana Galizia’s family has asked the Courts of Malta to replace the magistrate assigned to conduct the inquiry into the journalist’s death. Caruana Galizia for many years was a harsh critic of Malta’s Labor party and government. More recently she had expanded her criticism to include the opposition Nationalist Party. Her slaying drew swift denunciations in the tiny EU nation. “Daphne played a vitally important role in unearthing serious allegations of money laundering and corruption in Malta, including those involving senior figures in the Maltese government,” said Sven Giegold, a Greens member in the European Parliament. 0 Response to "Bomb kills journalist who exposed Malta’s ties to tax havens"